so the other night, just tuesday of this week, i was praying for some friends of mine and i sat down at the piano to just sing and pray and the Lord totally gave me a song for them. the next day i told a friend of mine that i wrote a song for them and she asked me how i knew it was for them. i don't know how to describe it. it was such a powerful experience with the Lord and i just knew that it was for them. i felt like the Lord opened up to me a glimpse of His tender heart of love for them and it was like i got to be the pen that wrote down this love song. it was one of those nights when the entire house was asleep, all the lights were off except the lamp by the piano, and is was quiet. it wasn't like i sat down with the intention of writing a song. i sat down and just started singing and out it came. tears streamed down my face because i felt like the Lord really ministered to my soul while i sang it, if that even makes any sense at all, and i was afraid that i would lose it because it was one of those kairos moments where it is there one moment and then gone the next. i got out my computer, turned on photobooth, and started taping my hands while i played so i would get down the words and melody before it escaped me. today i had the amazing opportunity to record this song that i have wanted to give to my friends. i am not that strong of a guitar player to go over and play it for them in person, and i really wanted to get it to them because i felt the Lord was really in it being something that encouraged them with His heart for them in what they are walking through. a good friend of ours has started recording music here and there and offered to come over to our house to get down some tracks to get a recording to give to them. after him spending 5 hours of his morning and afternoon over at our place today, we got something down he could work with. i cannot quite describe the experience in words. as we recorded today in my living room, i felt the Holy Spirit so tangible that it was so beyond what i can describe. the presence of God was so thick and so real... once again i felt so privileged to get to partner with the Lord in expressing His love for my friends. once again a kairos moment that i will keep with me forever. so intimate, so special, so priceless for me personally. after getting down the piano and guitar tracks, my friend who was doing the recording for me told me to hold out my hands in an open receiving position. he then prayed for the Lord to anoint my voice and for me to sing out of the deep places and for there to be an anointing of healing on my singing. i felt overwhelmed with the presence of God and then he pressed record and walked out of the house and left me alone with just the Lord to sing. i am so thankful for this experience. i feel like it is the beginning of something the Lord is doing in my life. 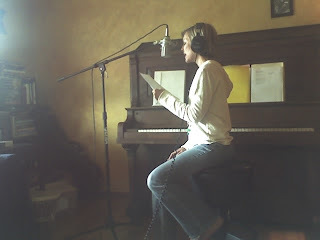 i am not really describing that i think i am going to be recording more of my songs, though i do have a feeling that it is really coming down the road. i think that as my friend prayed for me before he left me alone to sing to the Lord the song that He downloaded to me so sovereignly, i realized that i get the privilege to be a conduit of the Lord's heart to His people and His people's heart to Him. i am so thankful, so honored, and so overwhelmed with this responsibility and blessing. i had just told bill this wednesday, just a couple nights ago, as we stood looking out over the beautiful whiskeytown lake and the trinity mountains, that one thing that the Lord had put in my heart a long long time ago was for people to be sovereignly healed while i sang worship to Him. it so encourages my heart that i feel such confirmation of that today. help me Lord to have wisdom and revelation to walk out this amazing journey you have before me to sing over your people and demonstrate the power of Your love. jeff and laura, i love you and hope that this song takes you deep into the presence of the Lord, and you experience His nearness and His love that supplies all of our needsyou are an amazing man and woman of God and i am blessed to call you my friends. charis, you are so encouraging. it is amazing to see how the Lord is using you, with this song, with your spirit, and with this blog! aw, thanks mary! i really enjoy your blog as well. I love reading your writing. YOu're in the center of His heart, the center of His hand. Your obedience before Him is beautiful.